When a low-profile activist investor gained a board seat at Microsoft Corp. two years ago, corporate boards around the country were stunned. How had a shareholder with less than 1% of the software giant’s stock forced its way into the boardroom? It turns out that ValueAct Capital Management LP had some serious muscle behind the scenes. Founder and Chief Executive Jeffrey Ubben and President Mason Morfit had reached out to some of Microsoft’s biggest stockholders—large mutual-fund companies not known for rocking the boat—to ask for help. Several of them, including Franklin Templeton Investments and Capital Research & Management Co., which together held morein a than 6% of Microsoft’s stock, then contacted the company. Within five months, ValueAct had its board seat. Activist investors are prevailing more than ever in their battles to force change at large U.S. companies, in many cases because of support from big investors who traditionally have stayed quiet. And that is changing the way U.S. businesses respond to challenges from activist campaigns. 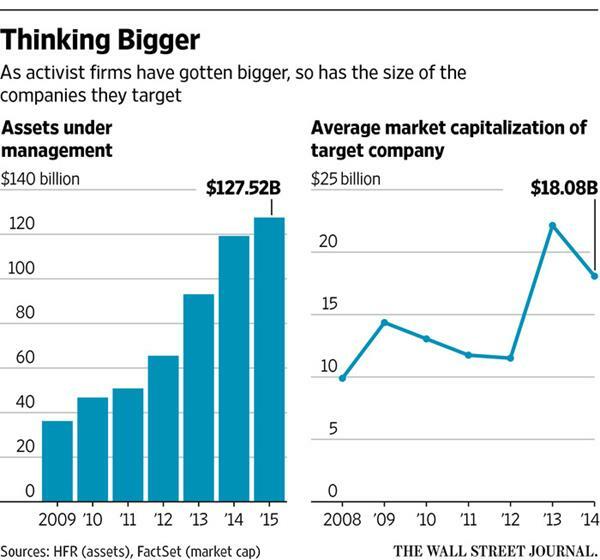 The shift comes as activist investors set their sights on bigger companies. Last week, investor William Ackman’s Pershing Square Capital Management LP disclosed a $5.5 billion stake in food giant Mondelez International Inc. It also emerged that ValueAct has taken a roughly $1 billion stake in American Express Co.
Large mutual funds have long been seen as friends of management who buy a stock because they liked what a company is doing. A decade ago, they would rarely even pick up the phone to talk with activists bent on challenging the status quo, according to activists and corporate advisers who specialize in such situations. These days, mutual funds often are siding with activists. They quietly have backed some of the most prominent activist campaigns, including Starboard Value LP’s removal of the entire board at Darden Restaurants Inc. last year and a push at General Motors Co. this year for a quicker share buyback. Although Nelson Peltz ultimately lost his campaign to get on the board of DuPont Co., he came close thanks to the support of many investors. In a survey this year of more than 350 of mutual-fund managers, Rivel Research Group, which polls investors for companies, found that half had been contacted by an activist in the past year, and 45% of those contacted decided to support the activist. That shift is changing the way fights play out in boardrooms. Rather than face one loud activist, companies sometimes are forced to contend with pressure from multiple shareholders. That has made some companies more receptive to activists and their ideas, such as share buybacks, cost-cutting and asset sales, even as debate continues about how such moves affect the health of companies. Activist investors take stakes in companies they think are underperforming and push for financial, strategic or leadership changes. Last year, activists gained board seats at a record 107 companies, 91 of them through pacts negotiated with the companies, according to data provider FactSet. This year has gotten off to an even faster start, with activists gaining seats at 86 companies in the first half alone. When companies resist, they are more often losing shareholder votes. In 2014, activists won in a record 73% of battles for board seats in the U.S., up from 52% in 2012, according to FactSet. The increasing involvement of mutual funds comes as retail investors have been moving money from stock-picking mutual funds to index funds and other funds that track baskets of securities. 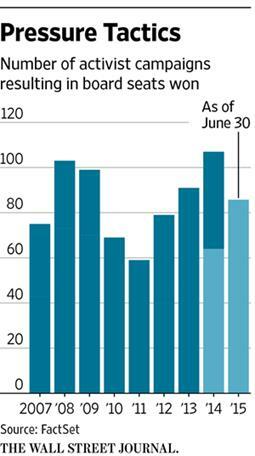 That is increasing the pressure on mutual-fund managers to beat the market, investors say. “Everybody is looking for an edge,” says Peter Langerman, the head of a large mutual-fund unit at Franklin Templeton, which oversees about $75 billion. Some mutual funds are voicing public support for activists’ positions. But many funds worry that admitting to working with activists will cost them access to management at companies in which they hold stakes, according to investors and corporate advisers. Private talks between activists and mutual funds are becoming more common. In April at the Milken Institute’s annual conference in Los Angeles, a group of activists and major institutional investors gathered in a closed-door meeting to discuss their relationships, according to one person who attended. They debated whether activists work in the long-term interest of all shareholders, or are only after shorter-term profits. The two groups agreed that companies are listening more to investors of all stripes, which they saw as a positive. The 10 largest shareholders of an S&P 500 company, on average, hold 44.7% of the company’s stock, says Lazard Ltd. banker Jim Rossman, who specializes in helping companies deal with activists. That means winning the support of major shareholders can put an activist on the path to victory, while losing it can spell doom. The average size of an activist’s stake in a target company shrunk to 6.1% last year, from 7.7% in 2006, according to FactSet, which suggests that activists can spend less and still win. Companies recognize the importance of courting their institutional shareholders and have been bulking up investor-relations departments, according to corporate advisers and investor-relations experts. Corporate lawyers and bankers urge companies to articulate a clear strategy or risk having an activist-recommended strategy sounding better. Some companies are having directors engage with shareholders regularly. Institutional funds, for their part, have “realized they have influence” and are saying, “We have a responsibility to have a sophisticated approach to voting,” Lazard’s Mr. Rossman said. Mutual funds have moved slowly into voting against management. They started on governance issues, such as forcing annual elections for directors and rejecting corporate pay in nonbinding referendums. This year, a widespread push forced companies from General Electric Co. to Citigroup Inc. to change their corporate rules and allow shareholders to more easily nominate directors. In the spring of 2013, San Francisco-based ValueAct, which has about $20 billion under management, asked for a single board seat at Microsoft for either its chief executive, Mr. Ubben, or its president, Mr. Morfit, according to people familiar with the request. 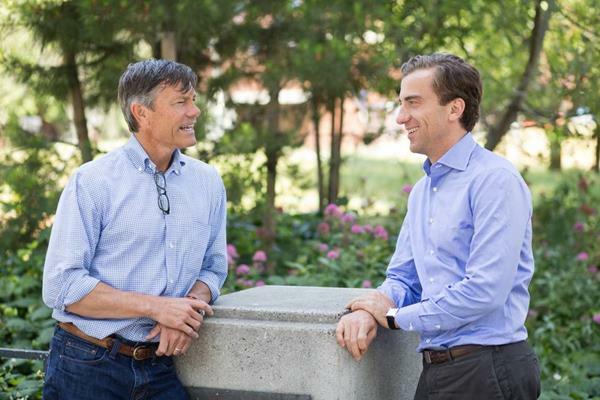 ValueAct indicated it would fight publicly for the seat if it couldn’t reach an accord. Messrs. Ubben and Morfit aren’t known for starting such proxy fights. ValueAct representatives have served on the boards of Valeant Pharmaceuticals International Inc. and Adobe Systems Inc.
ValueAct’s Microsoft plan was ambitious, given its less than 1% stake. But it has been building relationships with mutual funds for years. Tapping those contacts, Messrs. Ubben and Morfit called investors such as Martin Flanagan, chief executive of Invesco Ltd., and Mr. Langerman of Franklin Templeton’s Mutual Series unit, according to people familiar with the conversations. Their pitch: They wanted a board seat, and, if necessary, planned to run a campaign against the record of Steve Ballmer, then Microsoft CEO, these people say. ValueAct claimed management had been slow to adapt to new technologies and had lost the pioneering position it once held, hurting shareholder value. It wanted Microsoft to refocus on its technology aimed at large companies, such as software for corporate computing centers and a version of its Microsoft Office software that had been remodeled for the Web and mobile devices, these people say. Franklin’s Mr. Langerman and his team spoke several times with ValueAct executives to hear their pitch and agreed that Microsoft needed a change. Later, in discussions with Microsoft, they urged support for the activist’s position, according to those familiar with the talks. Capital Research, a mutual-fund giant with $1.5 trillion under management, had been expressing concern to Microsoft about its slumping share value before ValueAct came along, according to people familiar with the talks. When the firm’s technology analyst Paul Benjamin spoke with ValueAct executives, they agreed that Microsoft needed help quickly. Mr. Benjamin contacted Microsoft board members and urged them to work with ValueAct. In November 2012, in a sign of the brewing discontent, Capital Research’s funds and others withheld their support for the re-election to the board of Messrs. Ballmer and Gates, according to vote-tracker Proxy Insight. The two directors were still elected by a wide margin. More than 96.6% of shares voted for both, but the other directors got 99%. Such “no” votes are rare. Capital Research’s American Funds, for instance, back management in 97.4% of all campaigns, according to Proxy Insight. 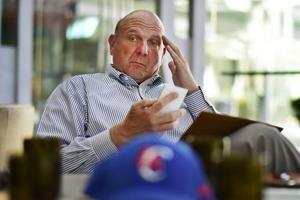 In August 2013, Microsoft announced Mr. Ballmer would retire. The company has said the leadership change was in the works before ValueAct arrived, and that the fund played no part in Mr. Ballmer’s departure. After his retirement was announced, Microsoft reached out to ValueAct to ask if it still wanted a board seat, according to people familiar with the discussion. ValueAct said it was happy with the change, but wouldn’t budge on its board demand. The following week—just before a deadline for an investor to launch a fight for seats—Microsoft announced Mr. Morfit would join the board. Darden Restaurants, which owns the Olive Garden chain, triggered a fight with activists when its board decided last year to sell its Red Lobster chain even as shareholders were seeking a vote on the matter, people on both sides have said. New York-based Starboard, fellow activist Barington Capital Group LP and Darden duked it out publicly. Starboard released a 300-page PowerPoint presentation that criticized everything from Darden’s management to the lack of salt in Olive Garden’s pasta water. Capital Research, once the largest shareholder, tried to broker a settlement. Capital Research executive Gregory Wendt acted as a go-between with Darden management and Starboard. He tried to find a way to change the board but leave some members in place for continuity’s sake, a common concern among institutional holders, people involved in the fight say. The fight turned bitter, and no settlement was reached. Investors voted out the entire board last October, a particularly whopping defeat for management. Capital Research voted for all 12 of Starboard’s nominees, say people familiar with the vote. At times, mutual funds offer only qualified support for activists. Investor Harry J. Wilson went public in February with plans to push General Motors for a stock buyback and a board seat. Mr. Wilson’s team quietly put out feelers to big investors to see if they would support him, according to people familiar with his campaign. At Franklin Templeton’s offices in Short Hills, N.J., Mr. Wilson made his pitch to portfolio manager F. David Segal and others. He said he wanted GM to repurchase $8 billion in stock. Shortly thereafter, Mr. Segal called GM’s head of investor relations and said Franklin’s Mutual Series unit was sympathetic to Mr. Wilson’s views but thought the buyback number was aggressive. Mr. Segal told GM that while shareholders had been grumbling about the issue in the past, it had become more public and the company needed to address it head-on, according to people familiar with the call. In early March, GM announced it would undertake, earlier than originally planned, a $5 billion buyback that was already in the works. Mr. Wilson pulled his request for a board seat a month after he had made it. ValueAct also has gotten fast action at times. In January, ValueAct released a letter it wrote to stock-market-indexing company MSCI Inc. ValueAct wrote that MSCI had rebuffed its attempts to get a board seat and hadn’t even checked the references ValueAct had sent. Other MSCI holders quickly weighed in. Independent Franchise Partners LLP and T. Rowe Price Group, both top five holders, wrote letters arguing ValueAct’s track record warranted a spot on the board. Three weeks later, ValueAct got the seat and two others.